Young children have a strong urge to become independent. Practical Life activities help them to perfect the skills they need in daily life. These activities teach children how to care for themselves and the environment around them. Activities such as table washing, watering plants, making a snack and washing up, enable the child to participate in daily life and promote the development of concentration, hand-eye co-ordination and muscular control. While learning essential life skills, the children are also developing the capacity to focus their attention for the entirety of an activity. Successful completion of such tasks gives children a real sense of their own achievement, and this builds their self-confidence. 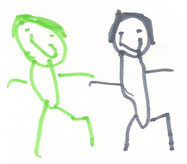 Children are vividly aware of the world, constantly exploring it and taking in impressions through all their senses. 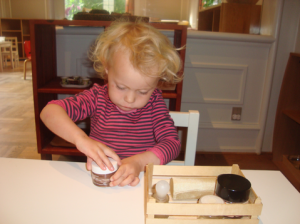 The sensorial materials encourage children to order and classify the physical properties of the world they live in. 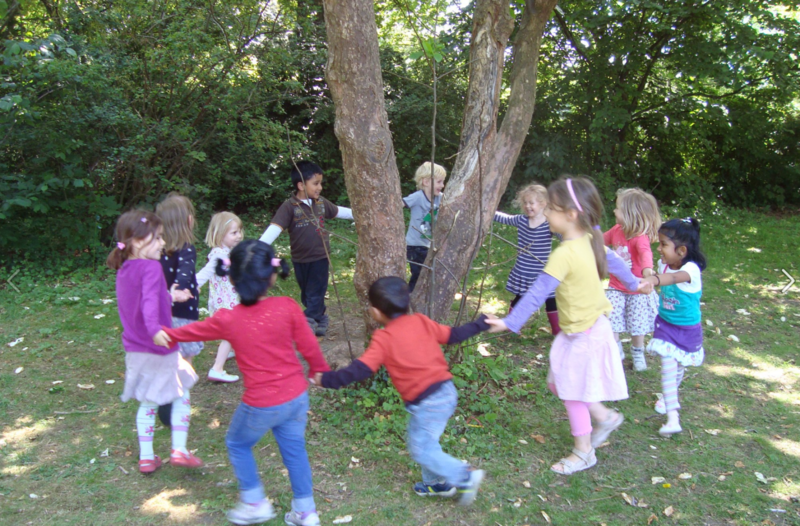 Activities focus on educating and refining the child’s senses in order to discover and learn about the environment. Here your child will learn to judge different heights, lengths, weights, colours, smells, sounds, textures and shapes. These activities stimulate and develop the senses, refining children’s powers of observation, perception, exploration and communication. The sensorial materials also prepare the child for reading and writing. 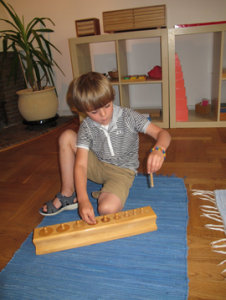 The Montessori approach covers a wide range of subjects which reflect the broad interests of young children. 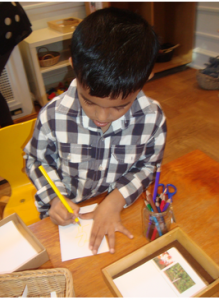 The Montessori environment stimulates these interests and extends knowledge and understanding of art and crafts, geography, history, music, theatre, science and the natural world. Cultures from around the world are explored and celebrated. 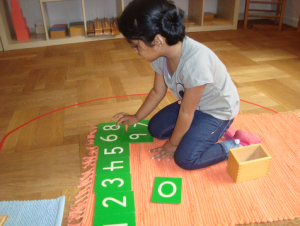 Montessori mathematics materials enable even a very young child to achieve a natural appreciation of mathematical concepts through his or her own efforts. This avoids the mental blocks which so often occur in children faced with purely abstract concepts. Specially designed equipment helps children to grasp concrete ideas along with sensory experience of numbers, sizes, quantities and mathematical operations. This builds a solid foundation of mathematical concepts, enabling effective future learning. The freedom offered to the children to express themselves creates many opportunities for them to communicate with their peers and the adults. We emphasise the development of vocabulary based on real experiences and the early preparation required for reading and writing. Advanced activities take the child well beyond the basic skills into reading and writing for interpretation, creativity and pleasure. A wide range of story and reference picture books are always available in the classroom. The joy in language and also in reading and writing is supported and encouraged by the specific teaching structure of the language material, and also by the linguistic role models, provided by the Montessori teachers and the other children. Storytelling, picture viewing, discussions with the children, theatre scene playing, speaking verses and singing songs all form part of the daily routine. Being outdoors is very important. 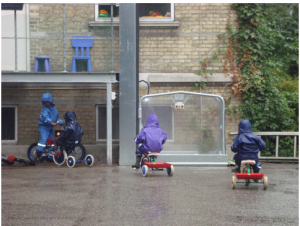 Children develop gross motor skills as they climb, jump and swing and also social skills as they take turns on equipment and play hide and seek. Montessori believed strongly that children should be in touch with the substance of their world, encouraging work with clay, gardening and growing activities and even building little houses. Children are not born with an innate knowledge of why we shake hands, or kiss, or rub noses depending on our culture and in the Montessori classroom they learn appropriate greetings. As they become aware of other cultures they are encouraged to celebrate differences and value them equally. During circle time children are shown how to move quietly and carefully around the classroom, push in chairs, wait patiently before politely gaining someone’s attention and are reminded how important it is to allow others to work undisturbed. These ground rules in the classroom give every child total security. Children also learn to notice if somebody needs help and that nobody is too small to be useful.